Cook the spaghetti, and add olive oil, 200ml of cream, the eggs and salt and pepper to it. Mix well then add half the pasta to a greased loaf tin. Cook the bacon for 15 minutes at 160°C, then cut it into small pieces and add it on top of the spaghetti in the tin. 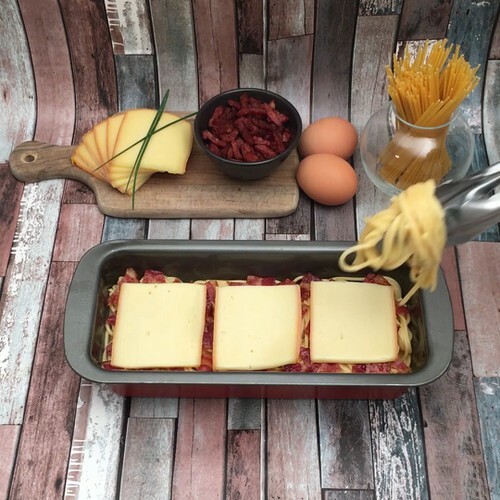 Add slices of the raclette cheese on top of the bacon and cover with the remaining spaghetti mixture. Push 2 small bowls into the spaghetti, and pour the remaining cream between the 2 bowls. Then sprinkle parmesan on the spaghetti top and bake for 15 minutes at 180°C. Once baked, remove the small bowls and pour the hot cream into the spaces. Add chopped chives into one and paprika into the other. Enjoy.